An area that was not taken seriously for many years was fielding in the deep. It's not glamorous to be there, as one is away from the core action and except on a few occasions when the ball does come in that direction, the spectators and commentators tend to ignore the existence of fielders stationed in the outfield. Of course, if the fielder is standing close to the boundary line within handshaking distance of the spectators, then they have lots of things to say to him! With the popularity of one-day cricket, fielding in the deep has become an important part of a coach's diary. A spectacular catch, a good stop at the fence, a quick and accurate throw or saving that valuable two or three is as crucial to the performance of a side as scoring runs or getting wickets. A captain needs to be aware of the speed and agility of his deep fielders. 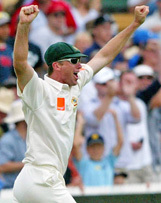 deep at Adelaide in the Ashes series of 2002-03. What makes a good deep fielder? The most important part is to understand where to stand. The reason is because only the fielder knows his ability, and the need to place himself in such a manner that not only enables him to narrow the angle of the balls travelling in his direction, which could result into saving valuable runs or a quicker interception, but also makes it easier for him to move back or forward when a catch is to be taken. Another important attribute would be anticipation. 'Anticipating' where (to the left or right) and how (quickly or slowly) the ball is likely to come to him, gives him that extra edge to attack the ball. These skills are instrumental in bringing about a run-out or a vital save. The area that one has to concentrate on developing is the ability to relax while catching or fielding the ball. At all levels of the game, watching the ball coming towards you is a sight that can bring fear. It gets worse when you are fielding in the deep, as you can see it travelling for some 60-odd yards before you stop or field it. I have seen Test cricketers petrified when the ball is hit at them in the deep because they are scared that any misfielding will be mercilessly criticized. It's this lack of positive thinking that makes the difference between a good or an ordinary deep fielder. One of the safest and good catchers was the legendary Kapil Dev. He rarely ever dropped a catch, was very agile and brisk, and had the most important weapon in his arsenal - a fantastic throw. These are the characteristics that make a good deep fielder. Catching is also an important aspect of fielding in the deep. The wind, light, atmosphere and the way the ball is hit can make the ball swerve and twirl in the air in weird ways. The palms have to be relaxed with just the right amount of firmness, or else the ball could pop out or go right through them. The Australian technique is to catch the ball in the deep with the fingers and palms pointing upwards like a baseball catcher, whereas the orthodox way is to catch the ball with the fingers pointing downward, in front of the chest just under the chin. Today, most fielders seem to favour the 'baseball technique'. There is no ideal way. One should do what one is most comfortable with. I used the chin as the focal point and at times the chest did come in handy in grasping a hard-hit shot, although I grimaced in pain later! The hardest part of fielding in the deep is the distraction. The crowd is just behind you, making concentration very difficult. At times such terrible verbal abuse is emitted that controlling oneself does get difficult. On other occasions it's a joke, a wisecrack, a firecracker or booing that comes sailing into your ears just when the ball is on its way in your direction. This can make life quite unpleasant. How many catches have been spilled due to this distraction? There have been occasions when the commentators have announced the fall of a wicket before a catch was held, and backtracked when the fielder spilt it. God save the fielder who drops a catch in the deep, for the vitriol and criticism emanating from the stands is not funny. The best 'deep' fielder is one who possesses all the abilities mentioned above and has the mental strength to handle himself on the field with the crowd not very far away.